my roses are also loving the rain we are having at the moment and most of my bushes are well laden. 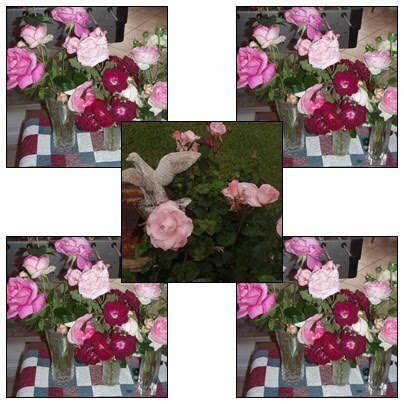 I have cut just a few roses to put in the house, there's still plenty more on the bushes. Don't forget there just a few more days to enter my giveaway. Comment on any post to gain an extra entry - the more posts you comment on the more entries you get. Roses are one of my favourite flowers and it's not because they don't give me hayfever! They are beautiful Gail. I can almost smell them!! Gorgeous roses Gail and I was lucky enough to get a bunch from my dear old aunts garden. Love roses! Gail how beautiful those Roses are i bet your house smells just wonderful and sweet. Beautiful roses, Gail. We took ours out as they did not like being close to the agapanthus on the other side of the fence. We had Mister Lincoln, Avon, can't remember a lot of the names now, but my absolute fav. would have to be double delight- I just love it. Your roses are beautiful. I have some apricot roses near the front fence, but the heads were blown off them last week in the wind and rain. Gail what program are you using for your photo collages. I have wanted to do this for a long time. Gorgeous roses and your vegie patch looks very impressive. You must have a very green thumb! lovely collage ! and of a favourite - especially nice when the only thing blooming outside here would be mums & dahlias! Beautiful roses Gail. Rose is my middle name so of course they are my faves. Gorgeous roses Gail.I only have white ones but would love to try growing some of the older varieties with their lovely strong scents.Roses would have to be one of mt favourite flowers and I'm drooling over yours right now wishing they were mine lol :) Barb.